In December Black Sheep restaurant launched their Winter dessert menu featuring a bevy of new desserts created by pastry Chef Rebecca Reed. Recently we got a chance to dive in and sample the new offerings to share with our readers. We’ve grown to expect impressive and creatively designed desserts from Chef Rebecca and these surely measured up to our expectations. The first dessert we dove into was one I expected to hate since I HATE coffee. But somehow I fell madly in love with Dirty Chai Creme Brûlée ($8). This dish is made by infusing cream with espresso and black tea to make a custard that is set using egg yolks cooked just until set in a warm oven. The dish is topped with a dollop of vanilla whip and 3 pieces of espresso shortbread. 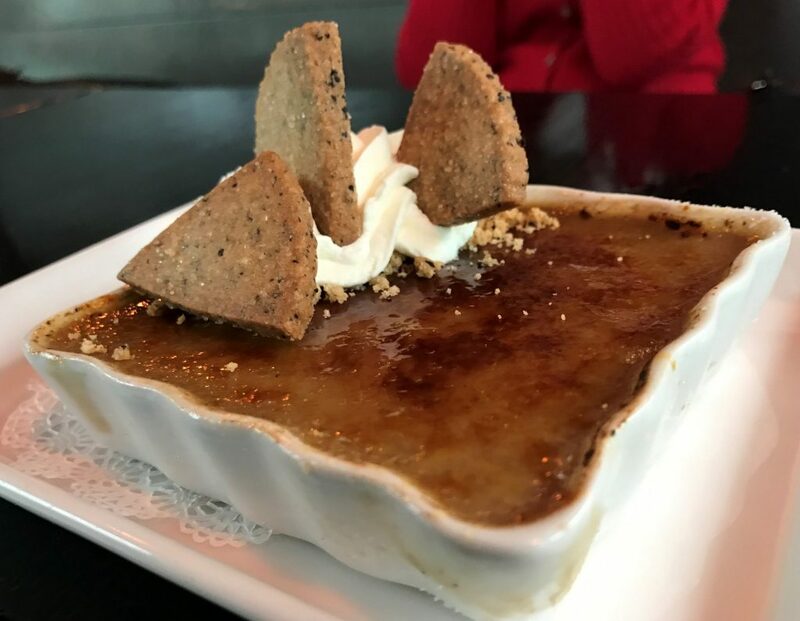 Chef Rebecca shared with us that she favors serving a cookie or something with a bit of crunch as a part of her creme brûlées because “Creme Brûlée always needs a little more crunch.” As an avowed coffee hater I would never have ordered this dish on my own. Amazingly this dish somehow hits for both a coffee hater and a coffee lover as it pulls out all the best parts of the flavor of coffee without any of the bitterness. The fact that it’s topped with some of the best shortbread cookies in town is an added bonus. If you love creme brulee there is no doubt you will love this dish! Along the lines of “everything’s better with bacon” comes the Pineapple-Bacon Upside Down Cake ($9). This pineapple upside down cake comes cupcake sized. It has a wonderful crunchy sugar coated exterior and sticky brown sugary interior. It’s made with a house made pineapple vinegar to balance out the richness. House cured bacon is fried until crispy and used as a garnish along with a generous portion of pork skins fried and tossed in maple sugar. The cake itself is sticky and sweet and wonderful, the pineapple vinegar definitely gives it more balance than your typical version. The house cured bacon lends a bit of salt and the pork skins have a taste totally different than any pork skin you’ve likely ever had before. They were actually my favorite element of the dish and I could have eaten bags of them. There’s a subtle complexity to this dish that elicits joy. Black Sheep’s Brown Butter Pecan Pie Slab ($9) differs from the standard Pecan pie with the use of brown butter which is butter cooked to caramelize the milk solids and develop a nutty depth of flavor. 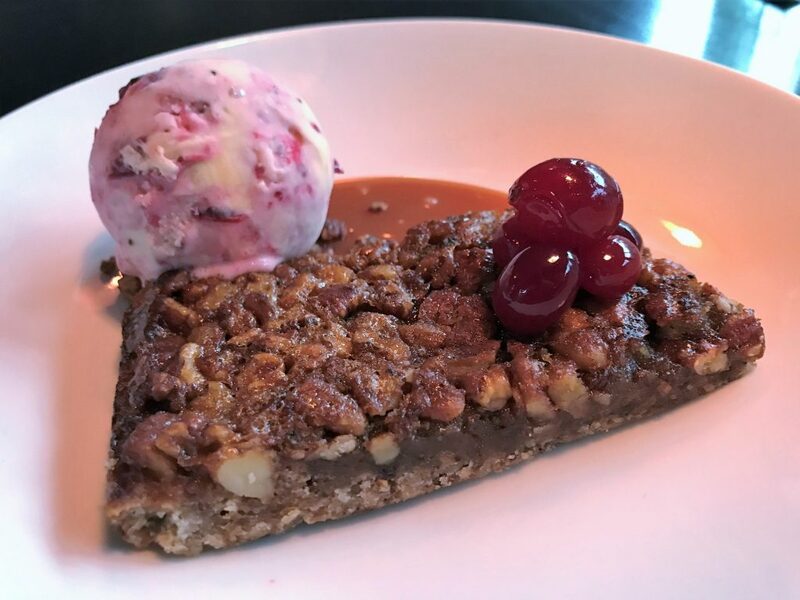 The pecan pie slab is served atop a pool of bourbon caramel and topped with sweet pickled cranberries and vanilla ice cream swirled with a sweet cranberry chutney. The dish is a thing of beauty. You’ll want to drink the caramel! Black Sheep’s S’more Pops ($7) are an elevated version of everyone’s childhood favorite. 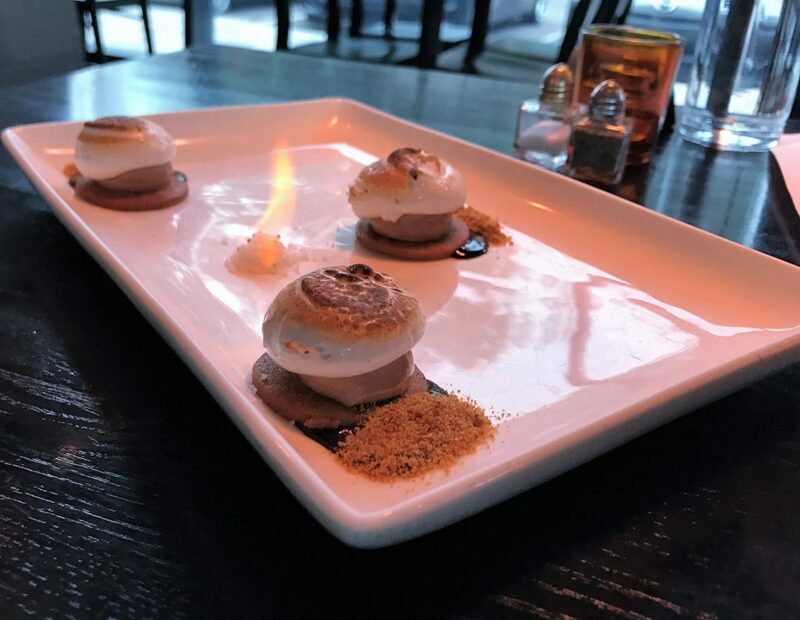 House-made graham crackers are topped with a Belgian truffle and then coated with a honey marshmallow torched to order. In the center of the dish, salt coated with high proof alcohol is lit table side for an effect that harkens back to moments around the campfire. This dish seems like a fabulous way to cap a romantic night out. It’s tasty and simple and wonderful with a great visual. Last but not least we dove into the largest of Black Sheep’s new dessert offerings, The German Chocolate Fundae ($11). 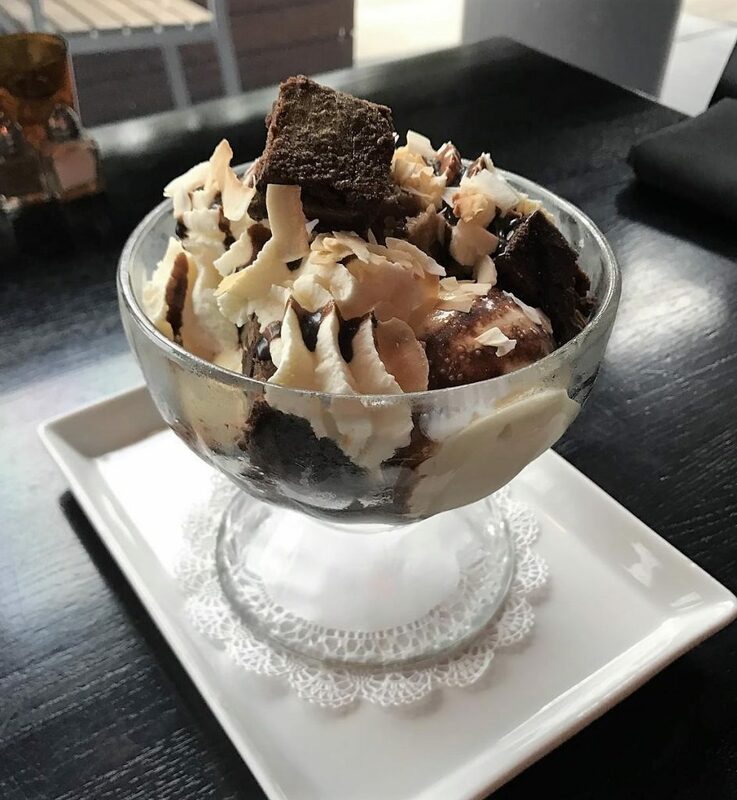 This sundae features house made toasted coconut ice cream with coconut-Pecan salted caramel German Chocolate cake filling, topped with brownie chunks, a rich chocolatey fudge sauce plus toasted coconut and vanilla whipped cream. It’s everything you could ever want in a more elevated version of a brownie sundae. 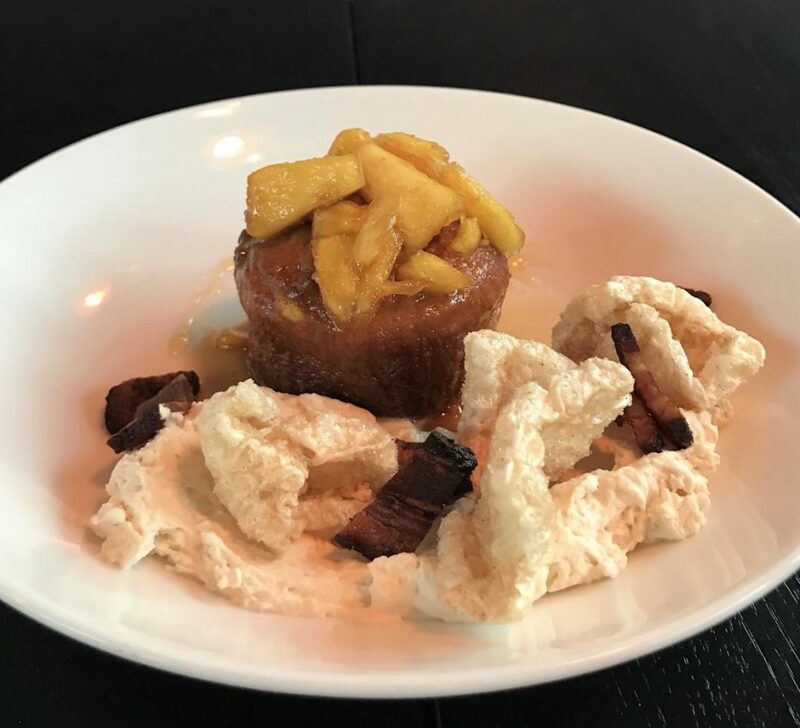 As usual Chef Rebecca Reed has set herself apart with a dessert menu for Black Sheep that offers both the next level of the familiar and sweet adventure. This dessert menu makes Black Sheep a wonderful place to just to pop in for dessert and also a place where you should never pass up dessert after a meal. Kudos. Tagged Alcohol Serving, Date Night, Dessert, Desserts/Ice Cream, Dinner, Full Bar, outdoor seating, pastry chef, riverside, Serves Alcohol. Bookmark the permalink.